Play Panels, Central Park, 1967, Richard Dattner Architect. Photograph by Norman McGrath. Here, we’re excerpting a section from Lange’s book, The Design of Childhood: How the Material World Shapes Independent Kids, that delves into the adventure playground and its history in New York City. That’s right—there was a time in the not-too-distant past when parents let their scamper over concrete ziggurats and build their own play structures with hammers and nails. Intrigued? Read on! 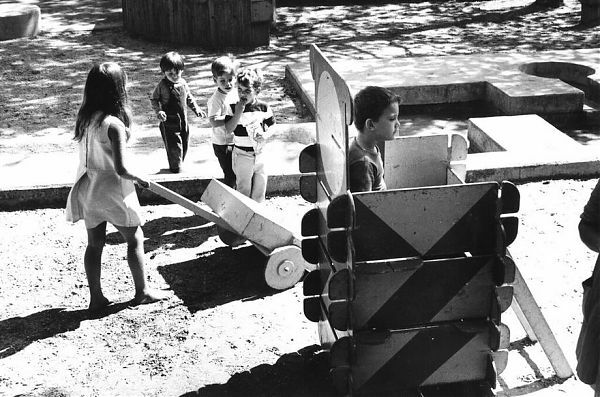 “The next best thing to a playground designed entirely by children is a playground designed by an adult, but incorporating the possibility for children to create their own places within it,” architect Richard Dattner writes at the beginning of his case history for the West Sixty-Seventh Street Adventure Playground, one of five he would eventually design at the periphery of Central Park. Where Kahn and Noguchi failed before him, Dattner and landscape architect M. Paul Friedberg would succeed.